Great is both modes. but the transformation from Bot to truck is needlessly over complicated and that hurts it alot. screen accuracy will be hard to top. Awesome feat of toy engineering. Only one problem. Where is his blaster rifle?! Why make a Prime this awesome and not include his iconic weapon? Also I hate the fact this prime doesn;t have rubber tires. And the chest pop out peg thing is just awful. If there were such a thing,i'd give this guy a 15. It has a seamless vehicle mode and a almost kibble-less robot mode. 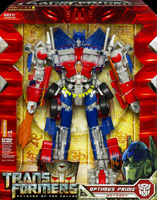 I do have two complaints.The chest is annoying, and the phrase"I am Optimus Prime"gets boring. But all the past Primes are now unworthy. This figure is awsome! If you fold out the back panels right you can even give him a jet-pack, who needs parachutes! Also there's a button under the head-ake rack marked with a triangle, push it for his truck mode sounds. Oh yeah, people are over-exaggerating on the difficulty of the transformation.It's pretty easy for a leader class..in my opinion. Since I don't have the first movie prime I cant tell which one is better. The only thing keeping this from being a 10 is the arm blades that constantly pop out. Robot better than before, truck not as good, many gaps. Long rocket science transformation, but fun in that you have to totally unfold him. I feel I need excess force, typical modern day TF as in things don't click in place very well. WHY THE SWORDS? Allthough the plainess of the colours arent detailed enough, the mold is superior to any previous Prime (except G1 & MP) I consider this inovative and a move up from the rubbish 2007 model. All you need to do is repaint and customsize it and its perfect ! The sword gimmick is a bit buggy and the transformation requires a degree in engineering for the first go around. Definetly not a toy for little kids, but far superior to the last movie prime. Movie accurate mold. Almost a masterpiece detail. Transformation is pretty hard but its getting easier. No rubber tires or extra sounds in truck mode. My second favorite ROTF fig. WOW! THIS GUY IS AWESOME! PICK HIM UP! awesome alt mode but his robot mode is... AMAZING though slitghtly hard to transform, not for 5-9 year olds! I refer to this 1 as the "Movie Masterpiece Optimus Prime." What more needs to be said? A must have. Transformation is not nearly as bad as people make it out to be - don't let that scare you from picking up this figure. Wish it had rubber tires and a better sword fold away design. Almost Masterpiece-like. Get him. Favorite ROTF toy thus far. Not as good as last prime in itself, but since it will supposedly combine with jetfire I will give it extra points. VERY HARD TRANSFORMATION. Looks great in both modes but bot mode is quite hampered by the new sword gimmick and arm panels when posing. Transformation either way is extremely complicated with a number of "just mash it until it all clicks into place" moments. Still prefer last one.